Sun, water, waves and wind. Not a holiday on the Algarve, but Portugal's power sources for the future. On the edge of the sleepy town of Moura in southern Portugal is a scene straight out of a science fiction novel. Glittering panels are being mounted on frames the size of tennis courts, then planted in lines facing the sun. There will be 2,525 of the frames and hundreds are already in place. When this futuristic array is completed, the frames will keep their faces turned towards the shiniest place in the heavens. They are designed to swivel and follow the sun as it rises and falls, pulling in every last bit of energy. It is the latest step in Portugal's plan to switch electricity generation from fossil fuels to renewable energy sources. The target is 45% from sun, wind and other renewables by 2010, with 60% already viewed by the government as achievable in future years. To its backers, Moura represents the coming of age of solar power. 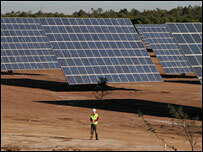 It will be the biggest photovoltaic power station in the world, five or six times as productive as its nearest rivals. "It proves that we can do big photovoltaic power plants," says Francisco Aleixo from Acciona Solar, the company behind the project. "It's important to show people that it is a viable technology." The Moura building site covers 130 of the sunniest hectares in Europe. Acciona says it will produce as much power during a year as 30,000 homes would use. It illustrates how Portugal has embraced renewable energy, pushing it near the top of the European league. The UK only gets 5% of its electricity from renewables, while Portugal already gets 39%. The UK target for 2010 is just 10%. Portugal has been spurred into action by its lack of conventional fuels such as coal and oil. The country has to import 85% of its needs. "By 2020 we will be between 55% and 60% of renewable energy," Manuel Pinho, Portugal's Minister for the Economy and Innovation, tells the BBC. "I think that is quite feasible." In the rugged north, the biggest wind farm in Europe is under construction on the mountains of Alto Minho. Off the coast, the first commercial wave farm in the world is about to be switched on in the next few months. 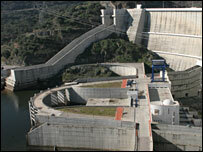 Ten new hydro-electric dams are to be built to support the proliferation of wind turbines on hilltops across Portugal. When the wind blows, usually at night, any unneeded power is used to pump water to the top of the dams, to generate electricity when the wind drops. The total cost of Portugal's rush for renewables is hard to pin down. As taxpayers, the Portuguese stump up by financing grants; as electricity customers they pay through slightly higher bills. Prices are a bit steeper than in the UK, though Portuguese businesses pay less. But Manuel Pinho believes the short term cost will be worth it. "The countries that will move first will have an advantage," he predicts. 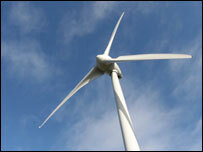 Wind will provide as much as 12% of the country's electricity needs. Up at the construction site for the Alto Minho wind farm, the developer Jose Miguel Oliveira says that Portugal has little choice. "We don't have oil and we don't have coal," he points out. "Wind is one of the resources we have, so we have to use it." But will the lights stay on, even when the wind stops blowing? Portugal's ambitious plans don't just depend on renewables delivering large amounts of electricity on average through the year. The grid has to remain stable at critical times. The Portuguese government is relying on the new dams to keep supply and demand in balance. 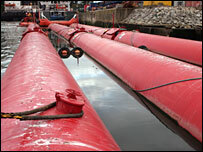 Hydro-electric capacity will be boosted by 50%. The UK cannot rely on hydro to provide so much of its power needs, but Mr Pinho warns that other countries will have to try to follow Portugal's lead. "The first priority is to get moving very fast because the cost of inaction is tremendous."